Guest posers – Arnold Schwarzenegger and Franco Columbu first time in Australia: also includes Clyde Bird, Frank Colombera, Paul Graham, and John Koziura. Frank Colombera was the overall winner. See Australia’s greatest amateur physique stars of the time including Robert Nailon and George Seredynski. This ground-breaking contest for Australia was staged at the Chevron Hotel and promoted by Bob Bruce and his company called 1971 Physique Show Promotion. The very special Star Guest poser was ARNOLD SCHWARZENEGGER in his first ever appearance in Australia, assisted by training partner and fellow guest poser FRANCO COLUMBU. At this stage Arnold was the 1970 and 1971 Mr. Olympia winner. Arnold won 7 Mr. Olympias in total. 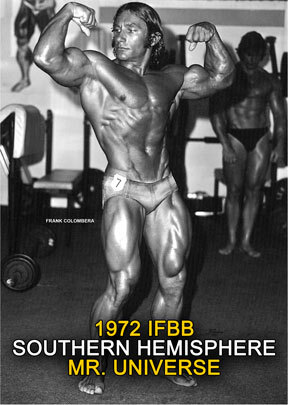 Franco later won the Mr. Olympia in 1976 and 1981. The event created the most excitement I have ever seen at a contest in Australia. Other big names in the contest included Aussie Legends Frank Colombera, Paul Graham, Robert Nailon, Clyde Bird and John Koziura. Frank Colombera was the overall winner from Paul Graham (pictured top left rear cover) and 8 time Mr. South Australia winner John Koziura. See Australia’s greatest amateur physique stars of the time in this historic IFBB Classic Contest. Shot on silent film by Wayne Gallasch with background music added. Wayne also took the photos. Robert Nailon photo courtesy Robert. This is followed by more posing by Clyde Bird, and then some awards for 1st to 3rd as follows in this order – George Seredynski, Clyde Bird and Robert Deegan. Next it is the Special Guest Posers ARNOLD & FRANCO doing their famous duo posing routine followed by Arnold posing solo. See Bob Bruce handing over the cash prizes to Frank Colombera and George Seredynski also gets an award. Followed by the winners posing with Arnold. The action then cuts to John Koziura pumping and posing on the Surfers Paradise beach, and later Colombera and Seredynski are seen pumping and posing, all on the day before the big contest. Promoted in Melbourne by Frank Burwash, May, 1972. With posing footage of Sonny Gloynes, followed by Frank Colombera (winner), Paul Graham and John Koziura with Lineup and Awards. Rare historic footage at the first Mr Australia I attended. I believe that Sonny won the Novice Mr. Australia title. On the day after this Southern Universe contest, I shot my classic pumping and posing films with Arnold and Franco poolside at the Chevron Hotel pool in Surfer’s Paradise.